MIAMI, July 19, 2018 /3BL Media/ – Carnival Corporation & plc (NYSE/LSE: CCL; NYSE: CUK) today donated $10,000 to the Oprah Winfrey Leadership Academy Foundation (OWLAF) in support of university scholarships for graduates of the Oprah Winfrey Leadership Academy for Girls - South Africa (OWLAG), an independent boarding school founded by Winfrey to provide world-class education to disadvantaged girls in South Africa. 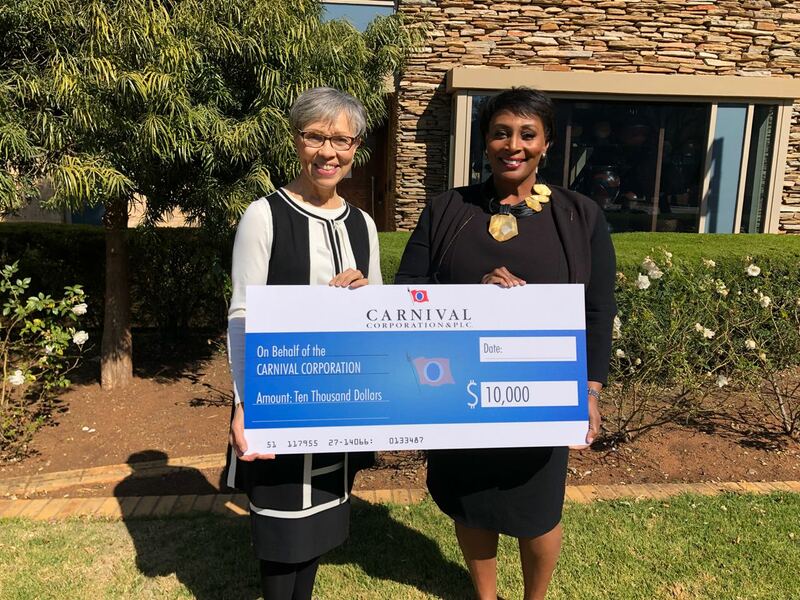 Carnival Corporation’s chief procurement officer, Julia Brown, presented the foundation with the gift during a visit today to the school in Johannesburg, South Africa, as part of her participation in the Centenary Delegation – a delegation of American executives visiting Africa the week of the famed leader’s 100th birthday celebration to discuss relevant trends and topics and build business relationships. The delegation visited the school as part of South Africa’s national day of service in celebration of Nelson Mandela International Day, observed each year on Mandela’s birthday. The Oprah Winfrey Leadership Academy Foundation provides funding for the Oprah Winfrey Leadership Academy for Girls – South Africa and is dedicated to helping its graduates attend colleges and universities. In December 2000, during a visit with Nelson Mandela, Oprah Winfrey pledged to build a school for girls in South Africa. In January 2007, the doors opened to the Oprah Winfrey Leadership Academy for Girls – South Africa. Through the Foundation, Oprah has contributed to the empowerment of scores of girls and their families. The U.S Centenary Delegation are a well-respected cohort of senior executives with global responsibilities at some of the world's largest and most well respected firms. They are widely recognized as business leaders, subject matter experts and trailblazers across their respective sectors. The purpose of the delegation is to engage in thoughtful conversation with South African business leaders about the vision, business operating environment, opportunities and challenges around doing business in Southern Africa. The U.S. Delegation and Business Summit are being hosted by India Martin, a 25 year veteran of financial services who now runs a leadership, executive coaching and global advisory consultancy, Leadership For Life (LFL), and she works regularly across the continent and is a proponent of the globalization of African brands. The Business Summit was co-hosted by Colleen Larsen. Larsen is the president of the 30% Club of Southern Africa, an organization that aims to develop a diverse pool of talent for all businesses through the efforts of its leadership and members who are committed to better gender balance at all levels of their organizations. Larsen is one of the leading voices for the sustainable advancement of women in the corporate and entrepreneurial space in South Africa today.